Networks of hidden, buried utility lines can turn projects that involve any level of excavation into nightmares. Hitting one of those lines can prove not only costly, but also hazardous for both workers and members of the public. For this reason, diligently marking known underground utility lines is a necessity. Blackburn Manufacturing Co. manufactures and fabricates small plastic flags — attached to either wire or plastic staffs — that have been used by contractors and engineers in a variety of fields, including construction, utility work, landscaping, soil conservation, farming, forestry, public works and all types of domestic lawn and garden use. These flags can be plain or custom-printed, with both vinyl or high gloss poly material available, making it easier to track the locations of underground utilities. A family-owned business, Blackburn Manufacturing Co. received its start in 1953 when E.A. 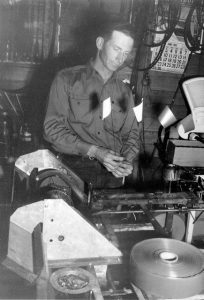 “Bud” Blackburn was tasked by a cousin, within the surveying industry, to come up with a better option to the old lathe stakes to mark out points of interest. After years of tinkering, Bud designed a machine that would glue a vinyl flag to a wire staff. 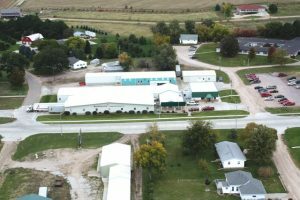 By 1955, the company was producing 1,681,000 flags — outgrowing Bud’s Royal, Neb., basement and resulting in a move to Neligh, Neb., in 1957. Over the years, the production of flags continued to boom, reaching 6,075,700 by 1960 and 25,933,400 by 1973. Throughout this time of growth, the company stayed within the Blackburn family, with Jim Blackburn returning from the Navy to help his father, Bud, with some of the management duties in 1973. Blackburn expanded in 1989 with a new plant established in Cambria, Calif.; Jim’s older brother Bob served as its manager. 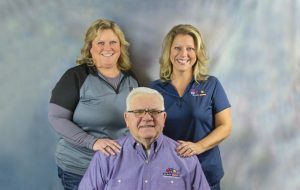 Today, Jim is also joined by daughters, Jennifer Blackburn-Nielsen, who became company president in 2005 when Jim moved into the CEO role, and Krista (Blackburn) Schindler, marketing director. In the fall of 2015, Blackburn purchased a new digital printer and cutter, which has allowed the company to expand its product offerings twofold. The state-of-the-art printer allows for full color printing and includes many new types of substrates to be used. The cutter allows for a custom cut product. Both of these machines have allowed Blackburn to expand into new markets while also continuing to discover more every day. With over 65 years of experience, Blackburn continues to be the No. 1 producer of quality marking flags. “We always try to set ourselves apart from the competition by providing high quality products at factory direct prices. We are a small company with strong values and we appreciate loyalty to our customers and from our customers,” Blackburn-Nielsen said. Blackburn prides itself as having the fastest lead times in the industry while consistently offering outstanding customer service. All of its flags are produced in the U.S. at either its Nebraska or California facilities. The company also uses the best quality raw materials available. A variety of customizable options are available. There are a total of four different flag sizes, with the two standard flag sizes being 2 1/2 by 3 1/2 inches and 4 by 5 inches. There are also over 14 colors of plastic and numerous Pantone inks for imprinting. In 2004, the company added a BMC Marking sign product, which consists of a coated paper card that is available in three different sizes and meets the posting requirements in the lawn and garden industry. The same year a polyethylene flag was added, which uses a heat seal to adhere the flag to the wire, eliminating the need for glue. A more rigid flag, the polyethylene option is more suitable in colder climates than vinyl. While flags are a huge part of Blackburn Manufacturing Co., it also carries Krylon inverted marking paint, which can be used in conjunction with marking flags to relay the positions of underground utility lines. 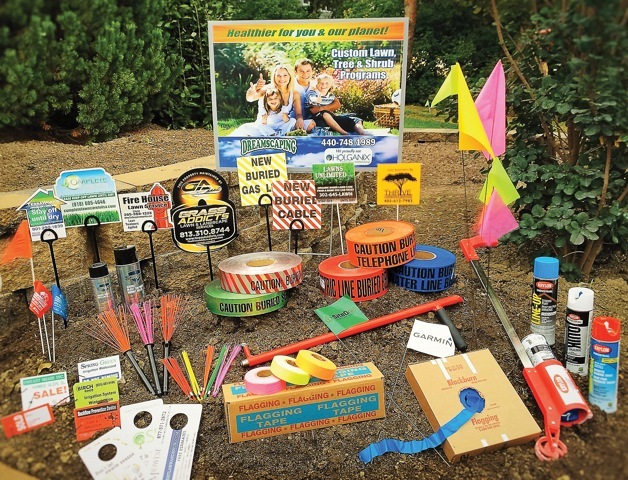 Additionally, there are barricades and utility warning tapes that can be used to mark and barricade utility job sites. Another popular offering is the durable Rhino marking posts — perfect for long-term placement. “One thing I’ve learned in this industry is that the products are always changing in some way. We try to be very accommodating to our customer’s and their needs, so our product line is always being added to,” Blackburn-Nielsen said. Dig with peace of mind using Blackburn’s tried-and-tested American-made products. For information, more testimonials and to view available products, visit blackburnflag.com.